So technically it's Wednesday in Sydney which means I'm late for this post.... BUT it's only 10pm in Bangalore which is where I'm writing this from so it's still Tuesday and my record is on track. Just a short note here to really highlight how someones attitude can really impact you - it a good way. I'm staying at the Oberoi hotel - and it's amazing. The hotel is lovely - well maintained, fantastic facilities - but one thing stands out head and shoulders above other hotels I've stayed at recently - the staff. To say that the staff here are fantastic would be an understatement. They are dedicated to making my stay as pleasant as possible. They cater to my every need, but are not obtrusive in their service. They are friendly and welcoming, and I've never seen one person without a smile. They know their guests by name - which is impressive when you consider the size of the hotel. Even more impressive is how they remember I like my coffee and bring it to me as soon as I go for breakfast each morning. It doesn't stop there though. They even give me a take away cup of fresh coffee when I'm ready to head to the office for the day. Last night however was truly incredible. Noticing that my shampoo was nearly empty (deliberate on my part as I brought just enough for the trip), I came back from the office to find a note in my bathroom from housekeeping. "I noticed your shampoo is almost over, so please accept this new bottle complimentary for your use. We hope you have a pleasant stay." Very sweet right? It get's better. 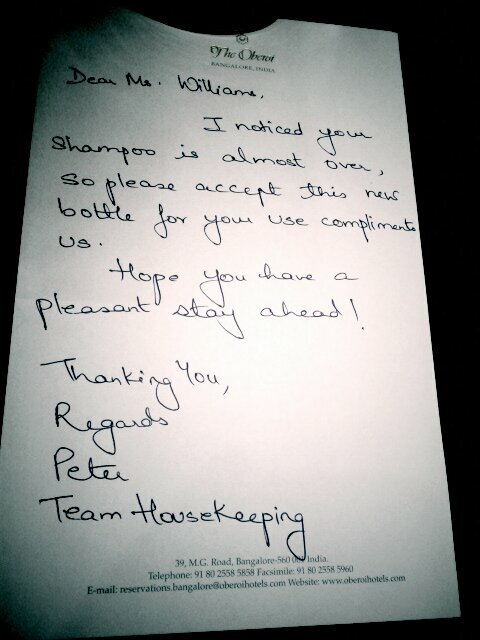 This wasn't any ordinary bottle of shampoo from the hotel. This was a brand new bottle of exactly the same shampoo that I was almost out of! That took effort. That required diligence and someone to go out of their way to do something thoughtful for me. That impressed me. Actually it blew me away. I've been really impressed by how the mood & attitude of the staff here has elevated my mood and thoughts while I'm in the hotel. I'm affected by them. I'm touched by their attentiveness and care. And their smiles have put a smile on my face. So the question I have for myself (and perhaps you might like to ask it too) is what does my attitude influence others to do? Does my mood put a smile on their face? Do my actions make their day? What can I do to influence the attitude/actions/mood of those around me. PS - Yes this is a picture of the note they left me. I love this place.